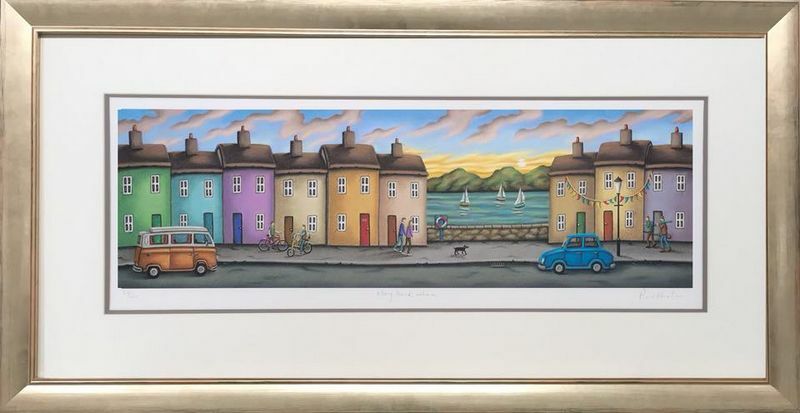 Way Back When - Framed - framed by Paul Horton // £369.60. A lovely new limited edition for August 2018 and Paul has released this artwork to celebrate his birthday, 60 years young. Combining his classic panoramic high street view but with a twist, replacing the shops with ordinary (residential) coloured houses. In the middle is a gap in the street and can you see in the background Paul’s sailing ships on a river - nearly always we only get to see them on his 'cove' scenes - so this is a bit of a treat. A wonderful mish mash of many of Horton's classic elements in one beautiful limited edition print, wonderful!